Born: 1880, St. Clement’s, Ipswich. Died: 10th May 1915; age 35; Died of Wounds – No. 4 General Hospital, Versailles, France. 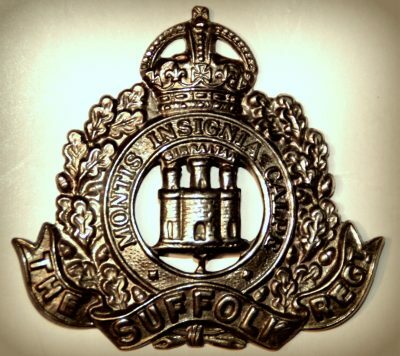 First Enlistment Details: Location: Ipswich; Date: 24th August 1898; Age: 18 years & 6 months; Religion: CofE. Next of Kin: father – Mr Samuel Chason, Sporles Court, Bell Lane, Stoke, Ipswich. Height: 5ft 3 1/2 ins, fresh complexion, blue eyes & dark brown hair. Home – 24th August 1898 – 27th February 1900 – Africa – 28th February 1900 – 23rd October 1902 – India – 24th October 1902 – 27th October 1905 – Home 28th October 1905 – 8th March 1907 – India – 9th March 1907 – 26th October 1910 – Home 27th October 1910 – 28th October 1910. Medals Awarded: Mounted Infantry Certificate 3rd September 1903, Queen’s South Africa with Clasps & King’s South Africa with Clasps. Discharge on termination – served 12 years & 66 days. 1881 3, Watts Court, Foundation Street, Ipswich. Ernest was 10 months old and living with his parents & sister. Samuel Chason, 49, a Fitter’s Labourer, born Ipswich. Emma Chason (nee Woor), 36, born Ipswich. Priscilla Woor Chason, 18, a Domestic Servant, born Ipswich. 1891 7, Beck Street, Ipswich. Ernest was 10 years old and living with his parents & maternal grandparents. Samuel, 59, a Labourer – Foundry. William Woor, 69, a Shoe Maker, born Boston, Lincolnshire. Maria Woor, 69, born Ipswich. 1911 33, Albion Street, Ipswich. Ernest was 30 years old, a Dock Labourer. He was married and Head of the Household. His widowed mother was staying. In 1906, Ipswich, Ernest, married Annie Laura Burton, born July, 1884, Bretenham, Suffolk. Ernest Richard Chason Burton, born July 1906, Ipswich. Priscilla M. Burton, born 1911, Ipswich – died 1912, Ipswich. William G. Chason, 1913, Ipswich. Bessie E. Chason, 1914, Ipswich – died 1916, Ipswich. Soldiers’ Effects to Annie Laura Mortimer – widow. Ernest is also remembered on the war memorial at St. Mary le Elms Church , Ipswich.